The agency’s study focused solely on the corporate social media accounts of the core 50 constituent companies on the Hang Seng Index ("HSI"). It excluded subsidiary consumer brands or business divisions. The 50 HSI companies, the agency pointed out, show relatively low social media use for their corporate communications or investor relations. Of the 50, 11 (22 percent) owned an official Facebook account and only five (10 percent) had an official Twitter account. On LinkedIn, 13 had brand pages and ten boasted their own YouTube channel. But presence on Chinese social media platforms, WeChat and Weibo was a bit better. About 38 percent of the 50 names had WeChat accounts and 40 percent were on Weibo. Lenovo and Cathay Pacific were the only brands that had some presence across all six social channels studied. The agency’s conclusion from the study is that most of these firms are missing potential communication opportunities. And facing some risks. "As an important global capital market, as well a being a digitally-connected city, the low engagement with social media among HSI companies is surprising," Charles Lankester, senior vice-president of reputation management at Ruder Finn Asia in Hong Kong explained. Companies that do not officially secure their social real estate, the agency also warned, leave open the opportunity for third parties to "brand grab" and create unofficial online content. As an example, Ruder Finn pointed to Twitter where just 4 percent of the Hang Seng 50 (just HSBC and Lenovo) have verified accounts, signified by the telltale blue tick. Even if firms wish to be cautious about social media, ignoring the platforms is actually a risk. In a global investor environment, where social media plays a role (official or otherwise), companies need to be out in front of issues, not catching up. "We are not advocating that listed companies in Hong Kong should jump on to social media overnight," Lankester said. "Just the opposite in fact. We do recommend, however, that companies study the online environment and ensure they have taken the necessary steps to protect and manage their social media portfolio. Once this is in place, more proactive engagement can be considered." Another risk for firms that have not established official social accounts is having content automatically generated for them. The study showed 39 of the 50 HSI companies (78 percent) have software robots create their Facebook presence, via third-party sourced content. Wikipedia, which virtually any one can edit and contribute to, is one of the major sources for such content. While it is unlikely to be derogatory, it certainly won’t tell the brand story as succinctly, or as accurately, as experienced brand stewards. "Hong Kong HSI Index companies are more than just public companies," Lankester said. "It can be argued they are ‘equity embassies’ for the Hong Kong economy. They represent the most visible, largest aspect of the local stock market. As a result, it is worthwhile for these corporations to at least consider the benefits and advantages of having a social media communications strategy operating in parallel with their mainstream investor relations program, to ensure they tell their investor story to the widest number of people." By comparison, another report from London based communications agency Battenhall, which came out in September 2014, identified that 90 of the FTSE 100 have Twitter accounts. Though only 37 of those were verified accounts, Battenhall’s report shows Hong Kong, as a global financial hub, lags in the social engagement department. "Even though Twitter is not widely used in Hong Kong," Lankester further explained, "it is an important global investor relations channel and the HSI is a global index. The value of the verified status just makes it easy for interested parties – both in Hong Kong and internationally – to instantly know a specific Twitter account is genuine, versus a spoof or fake. In the same way many people look for the blue tick in regular Twitter searches, it is a valuable piece of social real estate for any public company – be they in Hong Kong, London or New York." In Hong Kong only two of the Hang Seng 50 have verified their Twitter accounts. The least social companies on the Hang Seng, according to Ruder Finn, are China Merchant Holdings, China Resources, China Resources Land, PetroChina and Power Assets. None of these firms officially used any of the social media platforms over the study period (2-6 February, 2015). 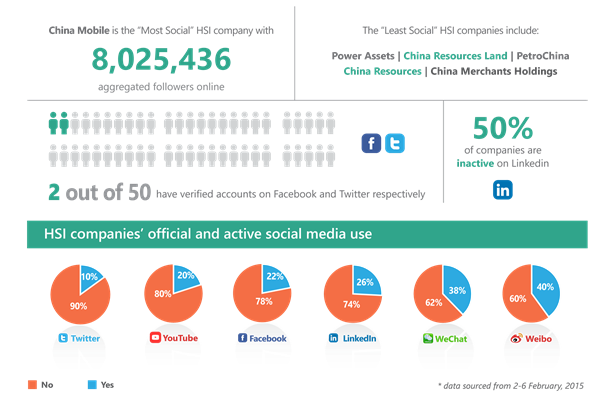 China Mobile came out as the most social. Social media brand grab risk – whether or not listed companies are active on social media, many companies have not verified their social media real estate portfolio. At a minimum, it is good practice to verify any corporation’s name. Don’t let robots tell your story – major social media platforms often automatically create pages and content whether or not a company is proactively present. Having an official social media presence means a company can define and describe itself rather than be described by unconnected, unauthorised third-parties. Get more value from investor relations – every HSI company has an investor relations ("IR") function. By linking the IR function to social media, greater value can potentially be derived from the IR investment already being made. While corporate websites serve as official information centres, social media can disseminate information more widely, as long as investors have been alerted in advance which social media channels will be used and that all information complies with relevant rules and guidelines of The Stock Exchange of Hong Kong and Securities and Futures Commission. Give investors the chance to "like" HSI companies – social media is used very effectively by many HSI companies as part of their consumer-facing marketing and communications activity. Companies have the same opportunity to provide corporate information and to tell their investor story on managed social media. "While the landscape of social media will almost certainly change," Lankester said, "one fact remains: Social media isn’t going away any time soon. Combined with a news environment undergoing revolutionary change, any public company would be well advised at least to consider what these changes mean and the potential benefits and advantages they offer," he added.